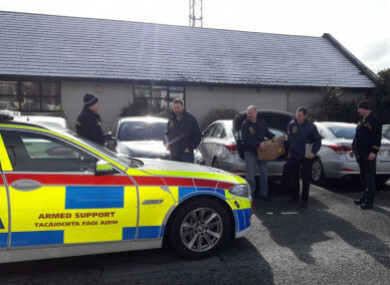 Members of the Garda National Economic Crime Bureau carrying out searches in relation to invoice fraud earlier this month. The exact location has been withheld. GARDAÍ ARE INVESTIGATING if a €500,000 invoice fraud carried out against Dublin Zoo was intended to benefit Islamic extremists in the UK. In December of last year, it emerged that Dublin Zoo had fallen victim to an internet-based invoice fraud scam that involved the theft of almost half a million euro. Five people were arrested last month in relation to the illegal enterprise but were later released without charge. A file has been sent to the Director of Public Prosecutions for consideration. TheJournal.ie understands that gardaí are liaising with their counterparts in the UK in relation to the invoice redirect scam perpetrated on Dublin Zoo. It is believed they are trying to determine if the scam was indirectly linked to an operation in the UK which sees considerable amounts of cash siphoned from legitimate businesses and pumped into accounts sympathetic to extremists. Invoice redirect fraud is carried out by scammers contacting businesses that regularly use suppliers and perform online financial transactions. The scammers will email, write to or phone a business pretending to be their legitimate supplier – but alter payment details so that the money is redirected to an account owned or controlled by the fraudsters. The business unwittingly pays out the money – as with the €500,000 paid over by Dublin Zoo – believing it to be going to their supplier. It is not believed that the alleged suspects in the fraud against Dublin Zoo are themselves part of an extremist movement. Instead, gardaí believe they were used as mediums to carry out the fraudulent actions. Separately, gardaí are also still trying to track down a man who they believe was instrumental to a number of frauds in 2016 which saw several Irish firms out-of-pocket to the tune of a total of €2.8m. The Pakistani-born man, who is in his mid 20s and lives in the UK, is suspected to have links to extremism. Similarities between the 2016 frauds and the Dublin Zoo fraud have led gardaí to examine any possible links between the operations. TheJournal.ie asked the Garda Press Office if it could comment on claims that associates of Islamic extremists were suspected to be involved in directing the fraud. While the press office did not comment on the specifics, it said that investigations are ongoing and that a considerable amount of money had been recovered in the Dublin Zoo fraud case. A spokesman said: “In December 2017 we confirmed that the Garda National Economic Crime Bureau is investigating a case of invoice redirect fraud at Dublin Zoo . “The matter was initially reported by Dublin Zoo to the gardaí at Cabra Garda station who immediately contacted the GNECB at Harcourt Square. Gardaí can confirm that investigations are continuing into this fraud at Dublin Zoo and can also confirm that, with the assistance of financial institutions, a substantial amount of money has been recovered in this case. Email “Gardaí investigate potential Islamic extremist link to €500k invoice fraud against Dublin Zoo”. Feedback on “Gardaí investigate potential Islamic extremist link to €500k invoice fraud against Dublin Zoo”.